However, no benefit really comes from learning everything in a story––leaning on Hemingway’s iceberg theory as support––and as long as the acting is solid and the scene is clear then, in a sense, we do learn everything. Everything we need to know, that is. For this tirade, I just wrote it all out. I had Jonny place all of his qualms on the table and, once it was out, I started whittling it down. Originally, his approach was much more academic and argumentative: present a claim then back it up with supportive examples. While that provided interesting looks into their history, I ultimately felt it undercut the point of the scene. This isn’t world-building happening here; instead, it’s the collapse of a world in on itself, the ceiling finally caving in. There exists evidence of the earlier, longer drafts of Jonny’s reprimand, most tellingly in the art. And while the page as originally drawn was based on a revised draft of the script, I realized that I was sacrificing art, emotion, and poignancy for the sake of words. So, like I have done before in this chapter, I redrew a key panel. In that panel, Jonny went from a jaded principal to an angry friend (not to mention that the original drawing was objectively bad), exactly the emotion that was needed for the scene. I’m not often beholden to words. I’m an ardent supporter of revision and rewriting. However, every draft of Jonny’s monologue I liked and, with each draft, I thought I nailed it. But the medium didn’t need that, the story didn’t need that, and the page didn’t need that and, with comics especially, such needs can’t be forced without severely compromising the success of the book. With the end of the book coming so quickly (only two more pages to go! 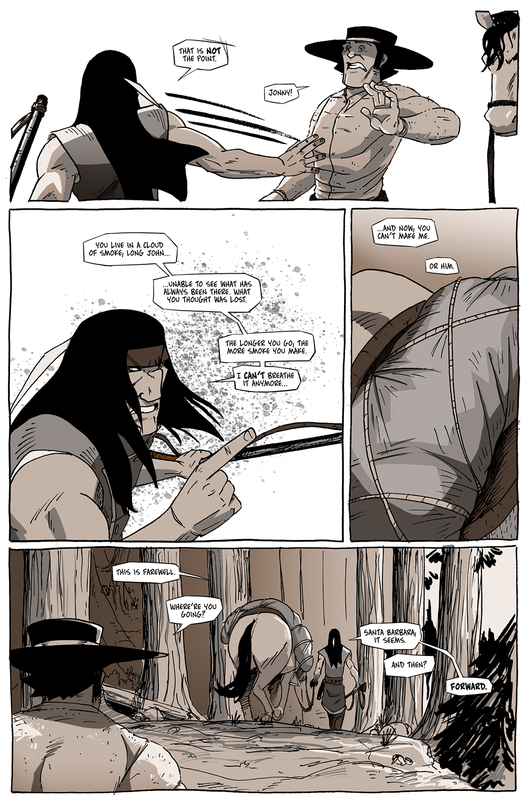 ), and a major plot wrapping up with this page, the nerves, again, got the best of me for awhile. I felt it was my job to not only answer questions the reader may have, but to give them answers with visual aides and flow charts so no doubt remained. But that’s not why reading is fun. That’s not what makes writing fun. What makes characters and scenarios feel real are not what we know, but what we can infer and compile based on the information we have been given. That’s effective because that’s often how we get through our lives––we do the best with what we have and, often, that’s enough.